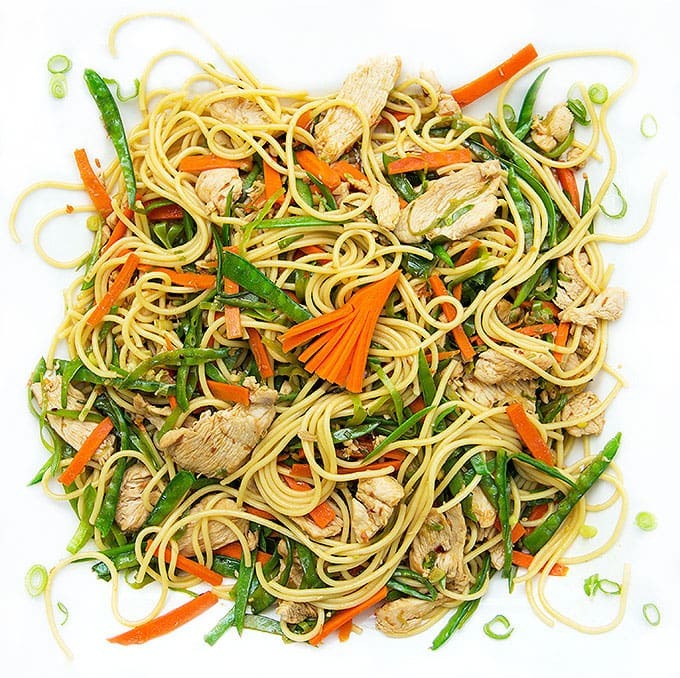 7 Flavor Precious Chicken: Stir-fried chicken, snow peas and carrots, with 7 delicious flavors, tossed with spaghetti - a festive, healthy delicious homemade Chinese dinner in 30 minutes. 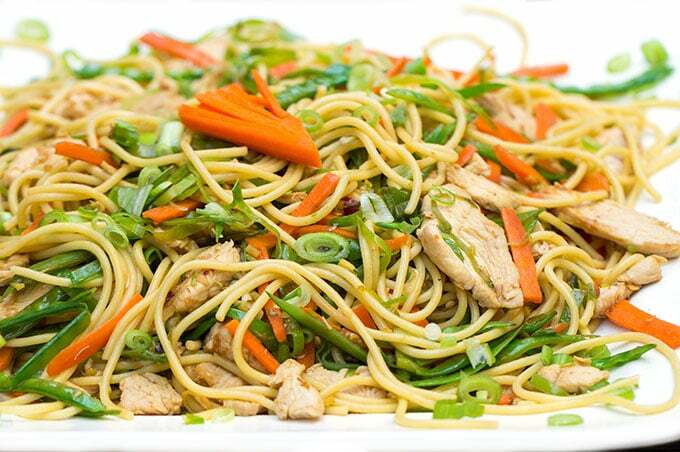 This is a fast and flavorful Chinese chicken and vegetable stir fry with noodles, made in just 30 minutes. A whole balanced meal in one wok and always a family favorite in my house. I adapted this dish from a recipe called 7 Flavor Precious Chicken which I discovered many years ago when I was living in Connecticut, at the checkout counter of my grocery store. It was in a little recipe booklet published by Kikkoman that I browsed through as I waited for my turn to check out. There were lots of tasty looking, easy looking recipes in there, all calling for Kikkoman products of course. I bought the booklet and I cooked a bunch of the recipes. This chicken and vegetable stir fry with noodles was ridiculously easy, packed with flavor, and a huge hit with my whole family. It quickly earned a place in our weeknight dinner rotation. Have you ever noticed how the names of dishes on Chinese restaurant menus often evoke scenes or emotions, rather than describing what’s in them? In contrast American restaurants are often extremely literal in describing the dishes on their menu. American restaurant menus often include details like the name of the farm that the meat or vegetables were sourced from, plus every ingredient in the sauce, accompaniments and even the garnish. I’m not knocking the American way. I like knowing all those things. But I’m also charmed by Chinese dish titles that tell a little story or set a little scene, like “Ants Climbing a Tree,” bits of ground beef or pork clinging to bean thread noodles, or “Buddha Jumps Over the Wall,” a shark fin soup that is said to be so delicious that it can entice monks to give up their vow of vegetarianism or “Lion’s Head Meatballs,” over-sized meatballs (the lion’s head) cooked with long shreds of cabbage (the mane). I love the name “7 Flavor Precious Chicken.” It evokes the sense of a very special chicken dish with lots of exciting flavors. And this dish is all that. The main ingredients in this dish are chicken, noodles, snow peas, and carrots. The 7 flavors are: soy sauce, sesame oil, vinegar, sugar, scallions, ginger, red pepper flakes. Slice the boneless chicken breasts thinly and toss with the 3-ingredient marinade of soy sauce, sesame oil and corn starch. Set aside for ten minutes. While the chicken marinates, make the sauce. In a small bowl whisk soy sauce, sesame oil, white vinegar and sugar. Slice and dice the veggies. I like to cut the carrots and snow peas into thin, long pieces but feel free chop them, if that’s easier. 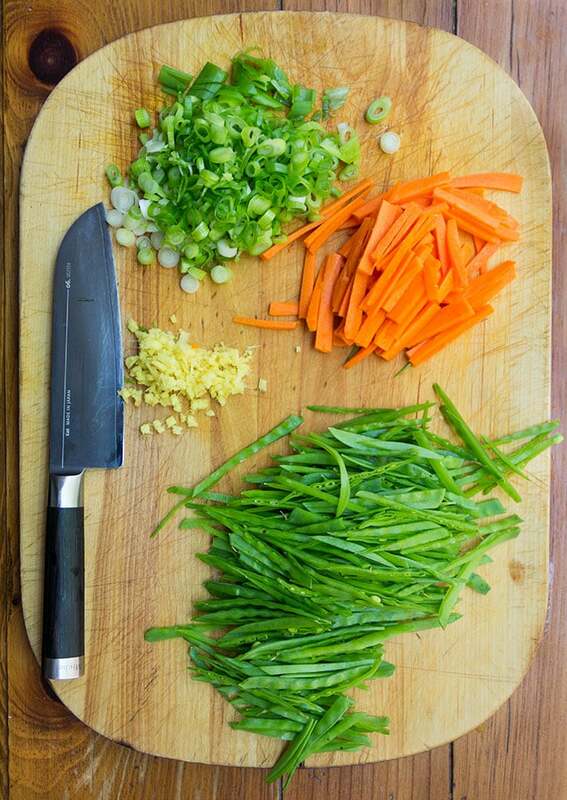 Slice the scallions thinly, crosswise. While the pasta is boiling, get the stir-fry cooking. Heat up the oil in a large skillet or wok. Stir-fry the chicken for about 3 minutes, until cooked through. Transfer to a plate. Add carrots and snow peas to the wok and stir-fry for a minute or so. Add scallions, ginger and red pepper. Stir-fry 1 minute longer. Remove the wok from the heat and add the chicken back in. Pour in the sauce. Heat the chicken and vegetables and sauce until hot. Pour over the pasta, toss and serve. If you’re a fan of homemade Chinese Food, you might also like to try cooking Chinese Orange Chicken. I think you’ll be amazed at how easy it is to get restaurant quality results at home. Here’s the recipe for Quick Chicken and Vegetable Stir Fry aka 7 Flavor Precious Chicken. If you try this recipe I hope you’ll come back to leave a rating and a comment. I’d love to know what you think! 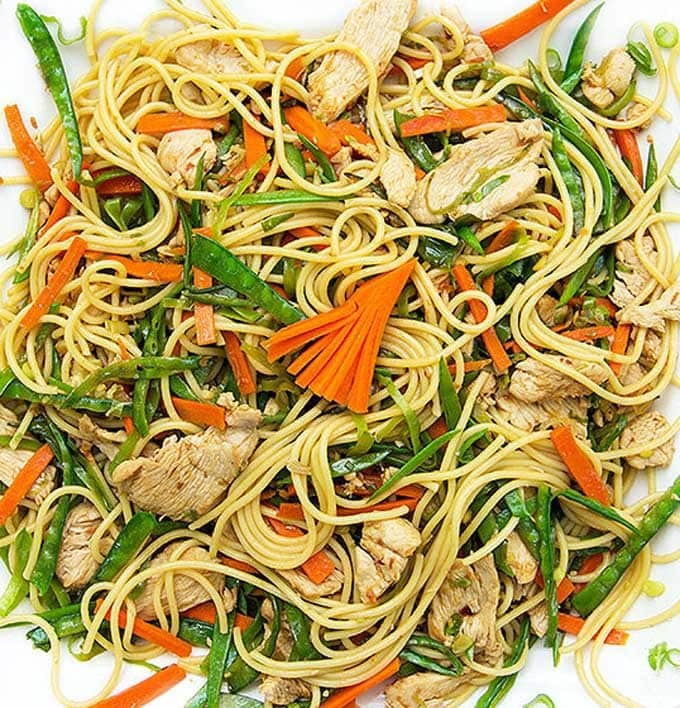 A quick, easy, flavorful Chicken and Vegetable Stir Fry with Noodles. A whole balanced meal the whole family will love. Marinate the chicken Whisk 1 tablespoon soy sauce, I tablespoon sesame oil and 1 tablespoon cornstarch. Toss chicken with marinade. Set aside for 10 minutes or so. Make the sauce In a small bowl, mix sugar, 3 tablespoons soy sauce, 1 tablespoon sesame oil, and 2 tablespoons vinegar. Set aside. Cook the Pasta: Cook pasta al dente in salted water, per package instructions. Drain and transfer to a large bowl. Tent loosely with foil to keep warm. Cook the Chicken and Vegetables: While the pasta is boiling, heat 1 tablespoon oil in a large wok or skillet over high heat. Add chicken and stir-fry for about 3 minutes, until cooked through. Transfer chicken to a plate or bowl. Add another tablespoon of oil to the wok. Stir fry carrots and snow peas for a minute or two. Add scallions, ginger and red pepper. Stir-fry 1 minute longer. Remove the wok from the heat. Add chicken and sauce to the wok. Set aside until the pasta is ready. Once the pasta is cooked and drained and in a big bowl, set the wok over medium heat. Cook, tossing, until the chicken and vegetables are just heated through. Pour over the pasta and toss. Serve immediately. This recipe is delicious! One of my roommates asked what Chinese restaurant I ordered it from and she was shocked when I told her I made it myself! It holds up well in the fridge and is as delicious cold as it is hot! I also like to add a little scrambled egg in it to make it taste like pad thai! Thanks Sophie. I’m so glad you and your roommate enjoyed the 7 flavor precious chicken. And I love your idea of adding scrambled eggs! That is such a wonderful dish and those photographs are breathtaking. Yummo. Hi Lisa, Just wanted to let you know that I just love your blog. Your recipes and clever writing makes each post an enjoyable read. I look forward to more great posts from you. Good luck in your journey and keep those post coming!!!! Love the name! I agree that it evokes more emotion than listing off ingredients. Makes me think of the delicate balance between all the flavors – spicy, sweet, earthy, etc. Hi there. I think this is a beautiful dish and was thinking of making it for a potluck but I noticed your recipe says ‘serve immediately.’ Do you think it’ll do well served room temp a few hours after I make it? Yes, I think it will be fine! Just give it a toss before you serve it, to make sure everything is sauced. You might also want to sprinkle on some fresh chopped scallions just before serving – for a fresh touch. Enjoy!